To prepare the chicken, slice it into bite-size pieces and place into a bowl. Mix the cornstarch, soy sauce, sherry and oil. Pour over the chicken and stir to evenly coat. Set it aside, while you make the sauce. 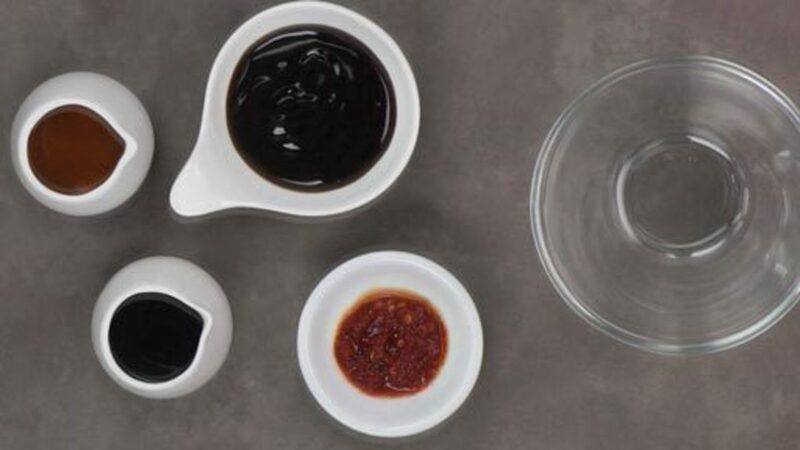 To make the sauce, simply combine the sambal, oyster sauce, soy sauce and sherry. Set this aside, while you prepare the rest of your mise en place. To prepare the rest of your mise en place, smash a clove of garlic and gather the slice of ginger. Peel the bottom stem of the broccoli and remove the florets. Cut the florets into large, even-sized pieces. Cut the stems a bit thinner, as these take more time to cook. Next, slice the green onions on a slight bias and set aside. You can either leave the almonds whole or roughly chop them. Place half of the chicken into the wok and separate any pieces that are stuck together. Let it sit for a bit before tossing. Stir-fry the chicken until golden and just cooked through. Once done, remove the chicken and set aside, while you cook the other batch. Once the second batch is done, add a touch more oil, if needed, followed by the broccoli. Let the broccoli partially cook for about a minute. Then add the sauce and toss to coat. If the broccoli is still quite hard and the sauce seems too thick, you can add a touch of water to thin it out. 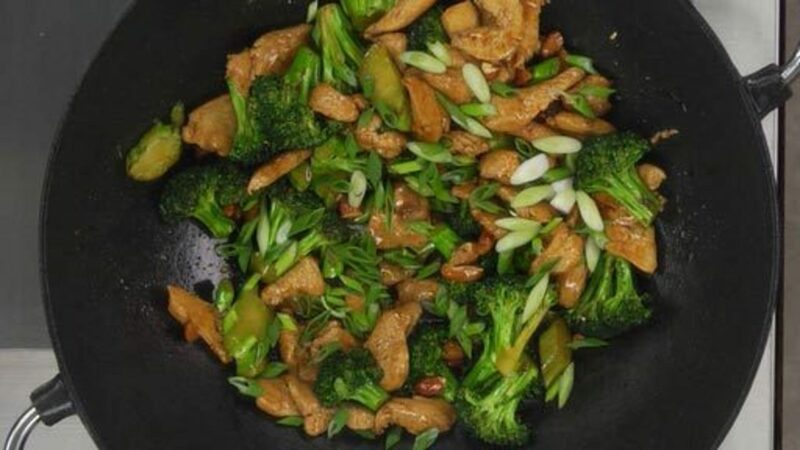 Once the broccoli has started to soften, but is still green with a slight crunch, add the chicken, followed by the almonds. Lastly, add the green onions and toss. Once everything has heated through, serve immediately and enjoy. Any veggies can be added to this stir fry. Bell peppers, bok choy, celery, carrots or onions all go well. Stir frys should not be soupy, nor should the vegetables be really soft. Cashews are also a nice alternative to almonds. For more seasoning, add additional sambal oelek and soy to each serving, if desired. I used a cast iron skillet for a good sear on the chicken and wish I hadn't. The meat got great color and flavor, but cast iron over high heat was too much and I had to move super fast so nothing burned. The flavors, however were outstanding, even though I couldn't find the sambal oelek. I improvised with crushed red pepper flakes and it worked. Next time I'll do a little leg work and visit my Asian market for all the correct ingredients. And I'll use a wok. I couldn't find the sambal oelek or oyster sauce at Whole Foods. Where is the best place to find this? I didn't have sambal, so I used Thai red curry paste, and didn't have sherry, so threw in some old red wine. Still it turned out pretty delicious. And it was a quick meal and well appreciated. Sambal and oyster sauce are available in most (if not all) Asian markets. They are both also available in many of the large grocery stores...in fact I am surprised that Whole Foods didn't have them. Do keep trying though as they add tremendous flavor to many dishes. Sambal Oelek is one of my favorite ingredients. http://rouxbe.com/drilldowns/159 But if you cannot find them, then Sean had a good idea to improvise with things like Thai red curry paste. It will change the flavor but it will still be delicious. Our new stove was installed a week ago, what it is really good for is stir frying as the center ring of the burner removes and the wok sits right down on the burner like they do in Asia. The combination of that and this recipe forcefully took us back to our time in Malysia, it tasted just right, like stir fried chicken did there, frankly amazing. Thanks Kimberly and the rest of the crew at Rouxbe. You're sooooo lucky to have a beautiful stove like that! Have fun cooking! I'd never tried or heard of Sambal Oelek before, but went looking for it in the local Asian market. They had it in 5 litre tubs! Fortunately I found smaller jars of the stuff in a different section, and this turned out just great. Didn't have any sherry so I substituted port. Was afraid it'd be too sweet of the flavour overpowering, but it was delicious in the end. We had to substitute asian chili garlic sauce for the Sambal due to our being out in the boonies. It worked out WONDERFULLY!! We were a bit nervous about the oyster sauce...but it seems we've been eating oyster sauce at chinese food places our whole lives and didn't realize it! It was a very familiar flavor that we had no idea was so crucial to many Asian dishes. I must say though that it probably would have gone abit easier in a wok, since a wok keeps the oil at the bottom and not spread all over like in a regular frying pan...probably easier to toss in a wok as well. Oh well...one more item to add to our kitchen wish list! Great recipe! Looking at the time of the other comments, I would say I am quite late on this, haha. 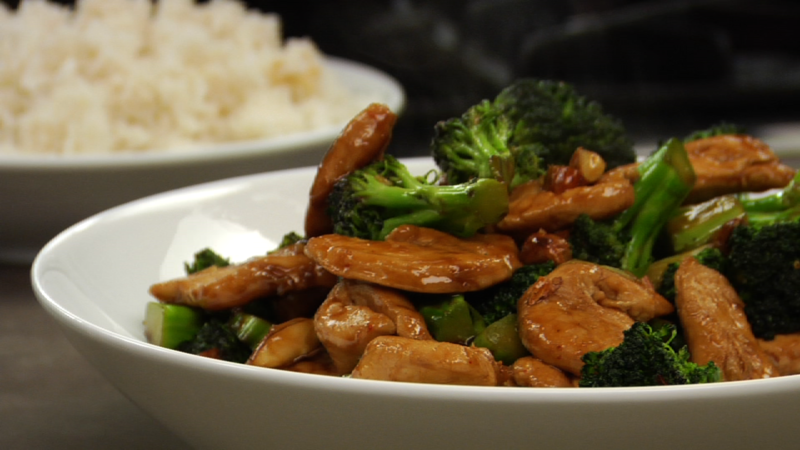 Having grown up with a dad who works in a Chinese restaurant and an aunt who owns one, "Chicken and Broccoli stir fry" is just one of those dishes one cannot go without learning. I really enjoyed this reciepe the both times I made it. The second time it had to be made without oyster sauce which ending up not changing the taste too much. Made this last night with flank steak (well Joe did) and it was really good. Just very quickly fried the beef first then removed it and cooked the broccoli. Once he cooked that and added the sauce he then added the beef back and gave it a quick toss. The only thing we changed is that we didn't add the almonds this time. Great flavor combination and colors. Cooking broccoli in a stir fry pan takes a long time. 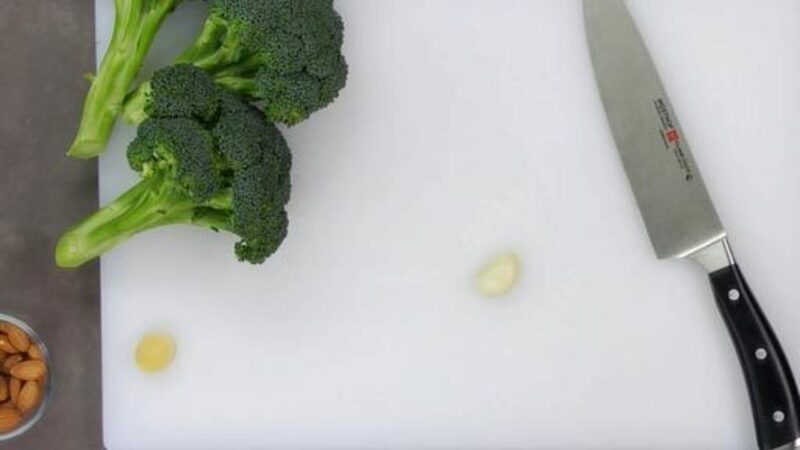 As the video shows, the sauce might dry out before the broccoli is cooked. To avoid this, I steam the veggie in microwave on high power for about 2 minutes before stir frying it with sauce. Can I substitute chicken with Beef? If so, what kind of beef should I use and will there be any changes to the sauce? Thanks! You could use beef tenderloin or a flank steak cut thinly across the grain (as shown in Step 1 from the recipe for Lomo Saltado). No changes to the sauce are necessary. Enjoy! Glad you enjoyed the dish. The technique is called velveting. It is a Chinese cooking technique used to seal in moisture in the meat during stir frying. It is commonly done with cornstarch + oil... or cornstarch + egg whites. Happy cooking! I have a Sherry cooking wine from Holland House but I don't want it to be too sweet, do you think this will work? Or what other sherry substitutes are available for this recipe? I would suggest that you try what you have on hand. You may find that it works just perfectly. Cheers! I went ahead and used the sherry I had on hand and it turned out delicious! This is way better than what greasy chinese restaurants have, thanks for this fantastic recipe!! Made the same dish except did not have all of the ingredients for the sauce so used toasted sesame oil for cooking and then added red chili flakes and lower sodium soy sauce at the end. I did use the ginger and garlic though the flavors had to compete a bit with the sesame oil. I also like my vegetables barely cooked so just added blanched broccoli, red peppers to heat through and then green onions and almonds at the end as well. The dish looked great with the brightly colored vegetables but the perfectly cooked chicken was best part thanks to the video instruction. I am looking forward to trying the full recipe but had such success with the techniques and following most of the recipe that I wanted to thank you. It depends on the type of heat source you have. Traditional woks sit inside a round opening with a flame directly underneath, which makes the bottom and sides extremely hot. If you have a gas stove, thin, cheap metal woks can can work well. Once used a few times, they self-season and don't react with acid as much. If you have an electric stove, your best bet is a large, stainless-steel saute pan. This allows the most heat to reach the entire surface of the pan so you can cook things quickly. Hope this helps! You could try using red wine vinegar instead of sherry if you like. Just note that it will alter the flavor slightly as sherry has a sweeter richer flavor than the vinegar which is obviously more tart or acidic. Cheers! Two quick substitution question. 1. Can you substitue Sherry Vinegar for the Sherry Wine? 2. Can you substitute shrimp and would you still use the velveting technique? 1. If you substitute sherry vinegar for sherry wine, you will get a very different flavor (sour, not sweet). 2. You can also try the velveting technique with the prawns. Cheers! Would Sriracha be a good substitute for Sambal Oelek? Any other suggestions? You can use any type of chili paste. They will all just have slightly different flavors and heat levels. You are free to experiment and find one(s) you like. Cheers! My husband uses Sambal on almost everything, so yes I always have it on hand. My husband loved this dish. I'm not one for nuts or spicy hot so I couldn't eat this dish, but my husband wants this dish once a week for him. Really its quick and easy to make. I grew up in the sunny tropics of the Asian continent so I was at first surprised to see that the chicken was seared and removed before adding it back. However, I understand the principles in doing so, and I think it's good because it ensure that the dish is still delicious even if the chef is unaccustomed to Chinese cooking methods. The way that people do stir fry here is to have short cooking times on very high heat with a few quick tosses so to us, Chinese cooking is the art of heat and wok mastery. There were other differences such as the choice of liquor and the fact that sambal was added but that's just a matter of personal taste among different individuals. Thanks for making Chinese cooking easy and still delicious to other parts of the world. Absolutely agree that Chinese and Asian cooking is an art. Most North American kitchens aren't equipped with the same screaming hot heat sources that sufficiently heat woks; therefore, some adjustments need to be made to try and achieve a similar result. And, you're right, the ingredients used in a stir fry comes down to personal choice. That's the beauty of cooking :) Thanks for your great feedback. Cheers! I am concerned about toxic qualities of Teflon. I have heard of new ceramic non toxic, non stick surfaces. Any brand advice? How best to determine temperature of pan/oil. Is it just experience and timing? For the best results, wok's require extremely high heat. This is why we do not use non-stick for stir frying. Most manufacturer's of teflon and other non-stick surfaces do not recommend cooking with high heat. You may want to check out the lesson on Pan Frying. This shows how to slowly heat up a pan and when to add the oil. If using higher heat and something like cast iron, adding the oil comes down to experience. If you add the oil and it smokes profusely, you'll need to pour out the oil, let the pan cool and start over again. The more you cook, the more you'll be able to tell when the pan is ready. It is just a matter of getting in the kitchen and practicing. Hope this helps! Followed the instruction except added baby corn, bamboo shoots, sugar snap peas and used unsalted cashews instead of almonds.I cooked it in my new (seasoned) wok made of carbon steel. I served it with coconut infused rice and it was a hit. Thank you for making me a better cook. Any ideas? Could I simply leave it out ? Here is a great site for substitutions (the link goes specifically to "substitutions for sherry"). If you do choose to leave out the sherry, just know that the flavor will be slightly different. Cheers! Good, simple recipe - a tasty way to practice stir-frying and to season the wok. I wanted to say, though, that check the sodium in the oyster sauce. I put a couple of TBSP of sauce that is 850 mg each and it was too salty. I'll just adjust next time, but still. Now, my question: I'm wondering if there is a way to reduce the amount of oil splatter as I'm frying. Typically, I'll pat the chicken dry before I fry it, but with it coated with sauce, I haven't done that and, well, I had to turn it from a distance. Advice? Yes, the sodium content will vary in different brands so it is important to get used to tasting ingredients wherever possible to understand how they will impact a dish. Tasting ingredients before using them and as you are cooking is an important habit to form. In terms of splattering when stir-frying, there's not much you can do. This is just the nature of stir-frying. Some oil will splatter and some will rise up into the air. You can wear a chef's jacket to protect your arms if the splatters bother you. It's also a good idea to ventilate the kitchen when using this cooking method. Cheers! Is fish sauce a good replacement? Alex- Oyster sauce has considerable sweetness. if you look and taste the products side by side, you will see how different they are. Yes, both have a "fish-seafood' flavor profile but they are fundamentally different products with different uses. Cheers! This is a real keeper. My husband and I both enjoyed it. I added some carrots and served with brown rice. The sauce was perfect. Thanks for another great dish. Wonderful recipe for the family. I parboiled broccoli, mushrooms and carrot sticks before stir frying which gave a perfect and just tender bite. Also boiled egg noodles and added to the stir fry at the end. An easy every week dish where most ingredients will work. Thanks! I've a proper Asian wok which I bought for 12 pounds online a while ago. The only problem with stir frying in a wok is that my gas stove doesn't generate enough heat. I will try this recipe tonight as I happen to have all ingredients (minus chicken meat) at home. It can be difficult to replicate the characteristics of restaurant stir fry (breath of the wok) if the BTUs are insufficient. But, experiment with it. Start by cooking ingredients in batches in order to maximize the pan temperature.